Flying in the day before a cruise is probably one of the most often suggested tips on both CruiseCritic and /r/Cruise, and I especially encourage anyone flying in from a cold climate in the winter to heed this advice. Our Air Canada Rouge flight was delayed leaving the gate – not due to weather, but apparently customs can’t have the Canadian and American passengers mix in the hallway as one plane boards and another departs. Gotta keep ’em separated. We managed to pick up some speed in the air and landed at nearly our original arrival time, despite this delay. I haven’t flown Air Canada Rouge in a few years, and it didn’t seem as bad as a previous flight I’d taken with them from Toronto to Dublin. The Rouge brand is known for a reduced seat pitch and fewer creature comforts in the air (eg: rent a tablet or use your own instead of seatback TVs.) The YYZ to MIA route on an A321, though, is short enough at 3 to 3.5 hours that it’s not too punishing. We were, however, subjected to some noise from the child in the row ahead of us, who had a constant stream of questions throughout the flight for their clearly uninterested parents. When those questions went unanswered, the kid resorted to singing “O Canada” but forgot half the words, then switched to mumbling half of the chorus from Camila Cabelo’s Havana repeatedly. I can only assume that if I become a parent, I will have to deal with this scenario on a daily basis. 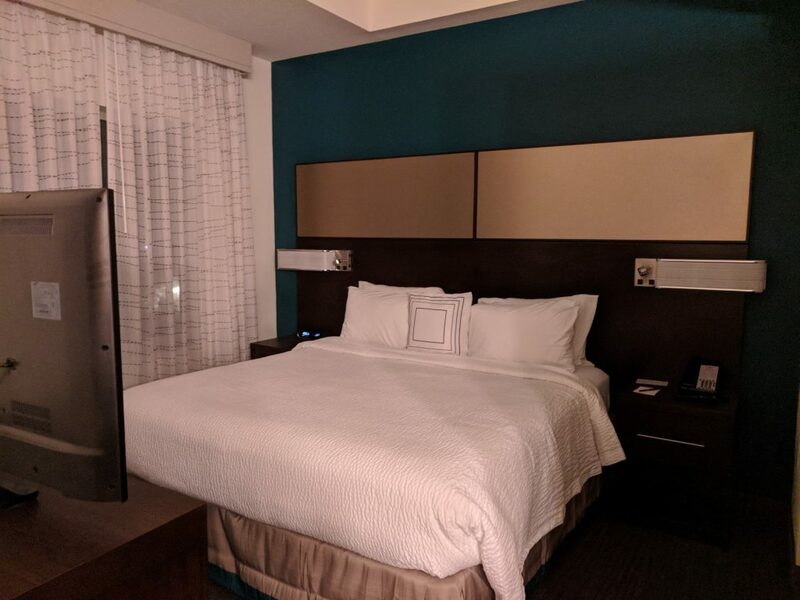 We’d booked a room at the Residence Inn by Marriott – Doral/West for the evening. 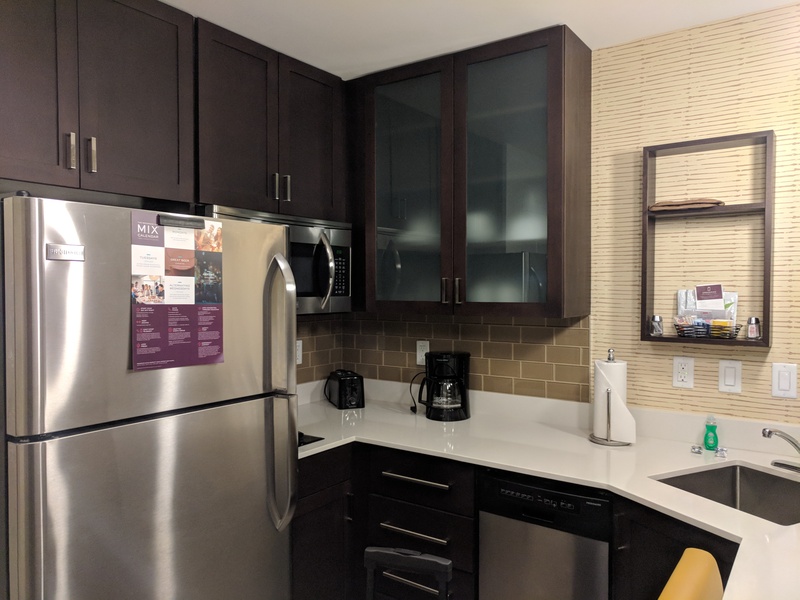 We’d previously stayed in the “closer to the airport” version of this hotel in 2015 and really enjoyed it, but Expedia had no availability – and I really like getting those credit card points for bookings through Expedia for TD. Upon landing and successful baggage claim, though, I called the hotel for the complimentary airport shuttle, then was told to call back once we’d reached the departures level. A bit confusing, but it only took a few minutes for us to get a couple of levels up. I guess this is a thing at MIA where hotel shuttles pick up and drop off on the second level. And waited, as it seemed like every other possible hotel shuttle in Florida had passed us by. 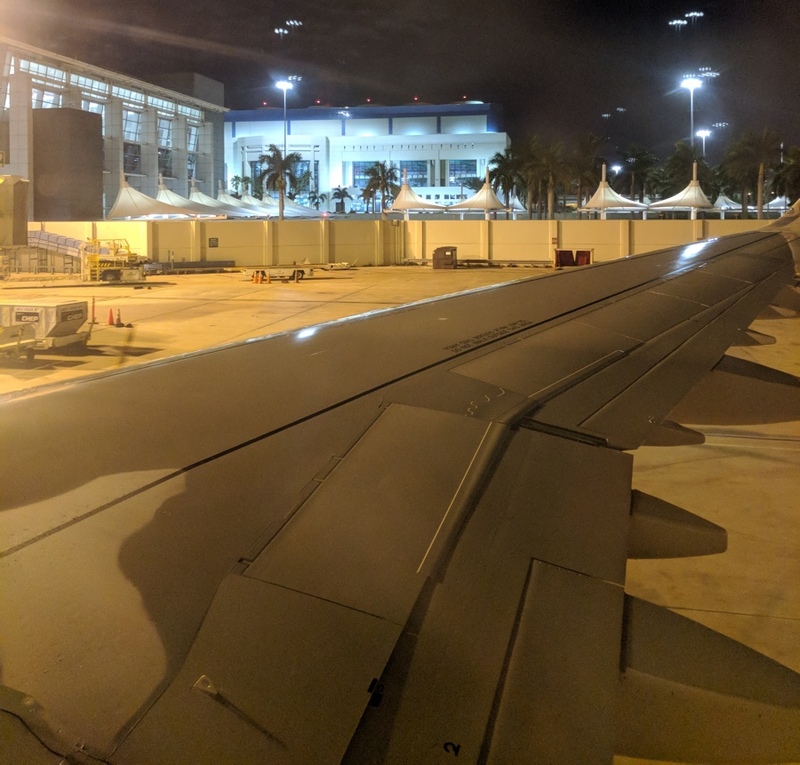 In reality, it wasn’t that long of a wait; Kayla’s photo timestamps indicate that it was about an hour and twenty minutes, all-in, to get off the plane and actually be standing in a room at the Residence Inn. The problem was when the shuttle showed up (and thankfully did stop), it had only one seat remaining for the two of us. Rather than wait another forty to fifty minutes for the single shuttle to make the round trip, Kayla and I each literally half-assed the passenger seat and held on to any available piece of protruding plastic for the next twenty minutes. I kept thinking the entire time that an eleven-dollar Uber ride would have been a much better option. The advantage to cramming ourselves in the front seat, and being the last pickup, was that our luggage was on top of the precarious pile in the trunk. Thus, we were the first people into the hotel and in line for check-in. This was a good thing, as there only appeared to be one front desk clerk on duty at 9:30pm. Henri the clerk was doing a very admirable job trying to check people in, and at the same time, defuse the onslaught of angry phone calls from people waiting for their own shuttle pickup. On a Saturday night – especially on the President’s Day long weekend – I would have expected more than one shuttle running, and definitely more than one person available to handle guests and the phone. Kayla was tolerant of the situation; I was in a terrible mood, mainly because I hadn’t eaten in an appropriate amount of time. This seems to be a reoccurring theme on our vacations. I should just probably accept that getting something to go at the airport or purchasing something on the plane will be better for both my stomach and relationship. The other issue with the Doral/West property is that the food options in walking distance appear to be non-existent. Next to it is the U.S. Southern Command military base covering a large area of land, and walking the other way leads to an industrial park. Conversely, both the Marriott and Hilton complexes nearer to the airport have hotel-affiliated bar and grills in at least one of their buildings. If you had a rental vehicle, this property would be a better option – but next time I think I’ll try to pick a hotel either closer to the airport or closer to the port, with an on-site or easily accessible restaurant being a key feature. 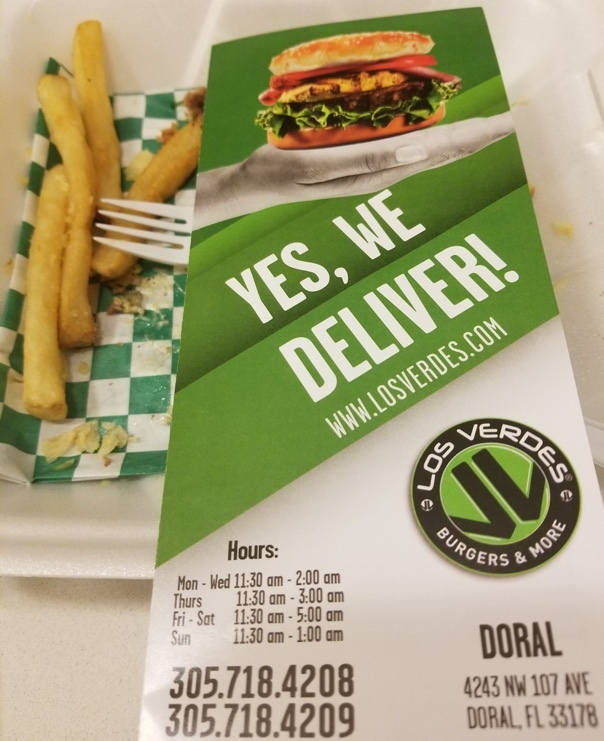 Henri, thankfully, was able to suggest a restaurant called Los Verdes that would deliver (and did so fairly quickly.) They had a fairly reasonably priced menu with a variety of hamburger, Cuban and Mexican options. I would highly recommend them if you’re in a similar situation. Other than the hotel shuttle and food options, I was pleased with the hotel itself – it was quiet, the room was well-appointed, and we like the bag of microwave popcorn included as a small snack. We ended up being able to make the most of the experience, and stay nearly until mandatory check-out time at noon on Sunday. Since our pseudo-selected/assigned ship boarding time was from 12 to 12:30pm, and the Doral/West Residence Inn is about 30 minutes away from PortMiami by car, this scheduling worked out nicely. What phase of the moon are we in? (Was there an expected eclipse on February 17?) It wasn’t an eclipse, but it was the first day of the “waxing crescent” phase where it was claimed that only 3% of the moon is visible. 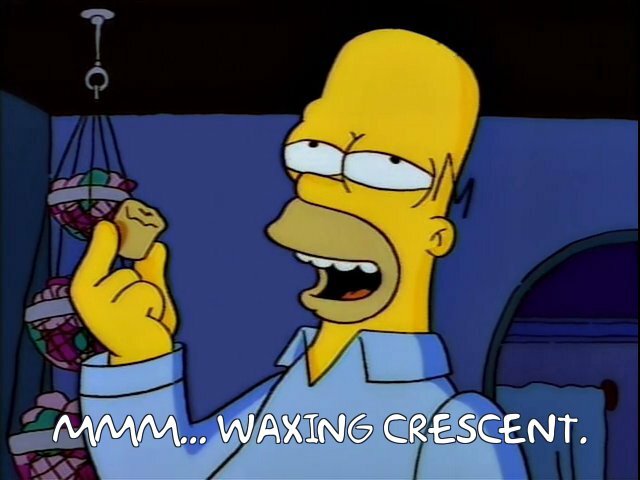 A waxing crescent sounds like something Homer Simpson might drool over. A followup question: Can you name a Pitbull track other than the one with Kesha? Not being devout followers of the gentleman, it was difficult to come up with anything on the spot. The best part of doing this Google and Wikipedia search was the successful campaign to send him to an Alaskan Walmart.